Be the first to share your favorite memory, photo or story of Alfred Landon. This memorial page is dedicated for family, friends and future generations to celebrate the life of their loved one. Bro. 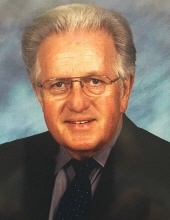 Alfred Landon Hadley of Campbellsville, Kentucky, son of the late James Oris Hadley and Susie Antle Hadley, was born on Thursday, May 20, 1937 in Cumberland County, Kentucky and departed this life on Friday, April 5, 2019 at the Green Hill Rehab and Care Center. He was 81 years, 10 months, and 16 days of age. He had made a profession of faith in Christ and was a member of the Green River Memorial Baptist Church. He had completed his Masters Degree from Southern Baptist Seminary, had been a Minister for 62 years for 13 different churches, and served on four missions trips with the International Mission Board to Brazil and the Philippines. Survived by his wife of 60 years, Mary Lou Kiper Hadley of Campbellsville, having united in marriage on December 30, 1958. Other survivors include two sons and a daughter-in-law: James Ray Hadley of Lebanon, and Thomas Lee and Jennifer Hadley of South Carolina; a daughter: Sara Lynn Hadley and her fiancé, Darren Shepherd both of Shepherdsville; three grandchildren: Terra Stowers of West Virginia, Chase Tyler Hadley of London, and Ryan Jacob Hadley of Lebanon; three great-grandchildren; two sisters and a brother-in-law: Loretta Bryant, and Orisnell and Clyde Collins all of Georgia; a brother and sister-in-law: Thomas Edwin and Barbara Hadley of Columbia; and a host of other relatives and friends. Bro. Hadley was also preceded in death by an infant daughter and a brother-in-law: Albert Bryant. The funeral services for Bro. Landon Hadley will be conducted at 2:00 P.M., Central Time, 3:00 P.M., Eastern Time, Monday, April 8, 2019 at the Green River Memorial Baptist Church with burial to follow in the Green River Cemetery. Bro. Steve James, Bro. Wilburn Bonta, and Bro. Jamie Bennett officiating. Visitation is requested from 4:30 P.M. until 8 P.M., Central Time, Sunday at the Cowherd and Parrott Funeral Home; from 7 A.M. until 9 A.M., Central Time, Monday at the funeral home; and after 10 A.M., Central Time, Monday at the church until time of the funeral service. Memorials are suggested to the Gideon Bible Fund, or the Lottie Moon Christmas Offering, which can be made at the funeral home or the church. To plant a tree in memory of Alfred Landon Hadley, please visit our Tribute Store. "Email Address" would like to share the life celebration of Alfred Landon Hadley. Click on the "link" to go to share a favorite memory or leave a condolence message for the family.